Free Fall Bucket List Calendars. It’s fall, ya’ll! The first official day of fall was last Saturday, so now it doesn’t just feel like fall- it is fall! But fall is a short season, so if you want to make the most of it, you need a plan! That’s why we created this handy printable calendar for October and November that doubles as a fall bucket list! 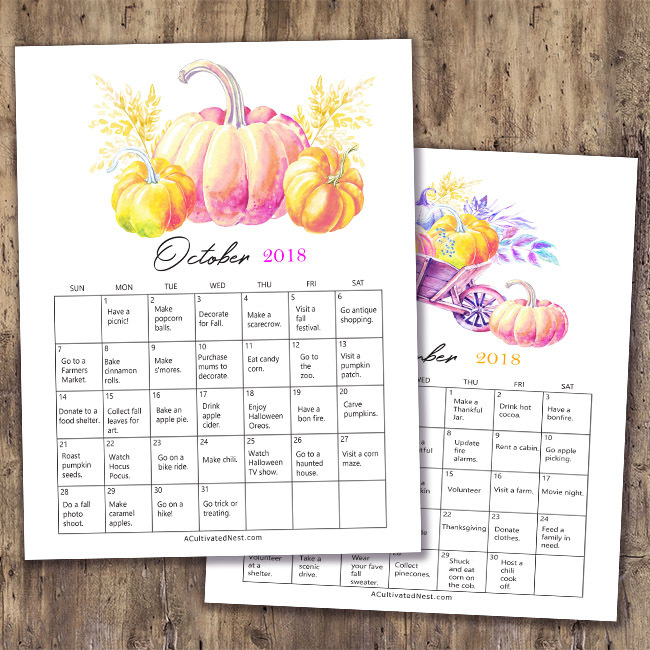 To make sure you don’t miss out on any fun fall ideas, get our 2018 Frugal Fall Bucket List Calendar Free Printables! All of the ideas on this fall bucket list calendar are easy and fun! And of course, they’re also inexpensive (even renting a cabin can be pretty cheap, if you shop around and only stay one night). Of course, you don’t need to do every single thing on this list to have a great fall. Just see this fall activities list as a kind of guide. Feel free to skip activities or add to them as you like. Also, if you happen to come across this post after Fall 2018 has passed, these calendars can still be useful! 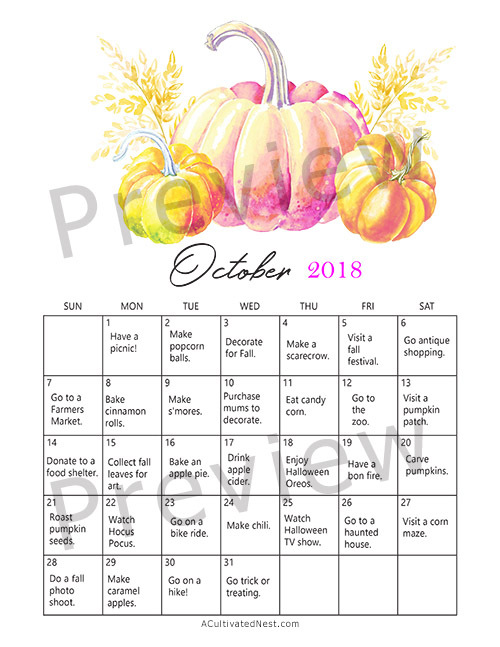 The dates on the printables may not line up with the current calendar anymore, but the ideas will still be a lot of fun. 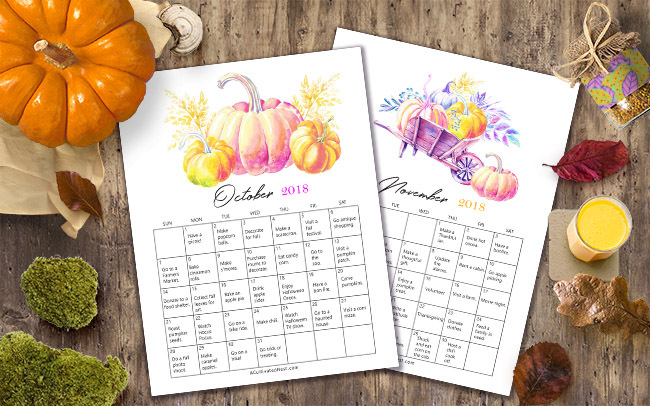 There are so many great ideas on these fall bucket list calendar printables that it would take forever to discuss them all. 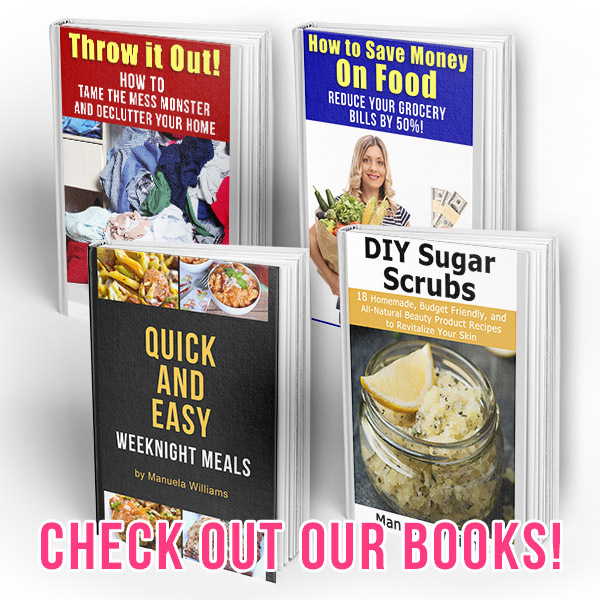 But I do want to cover a few where A Cultivated Nest has some handy DIYs, recipes, and other resources that can help you complete your fun fall activities! 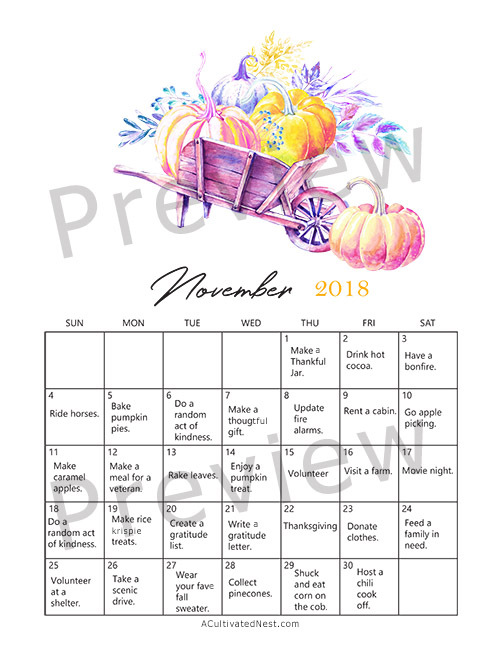 The free printable calendar is available at the end of this post. October 3rd- Decorate for Fall. Fall decorating doesn’t have to be expensive! Check out our 15 DIY Fall Home Decor Projects post for some ideas. Or decorate the really easy way and get some free printables out of our 15 Gorgeous Fall Wall Art Printables post. October 8th- Bake Cinnamon Rolls. Mix it up a little this year and make our semi-homemade skillet cinnamon rolls! October 9th- Make S’Mores. There are lots of ways to enjoy s’more flavor without making actual s’mores! Take a look at our s’mores brownie bake, s’mores Mason jar sundae, and creamy mini s’more trifles for ideas! October 10th- Purchase Mums to Decorate. It’s fun and easy to decorate your home with mums! Take a look at my post on How to Decorate for Fall with Mums, then read my tips on How to Take Care of Your Mums (Indoors and Out) to ensure that they thrive! October 16th- Bake an Apple Pie. Or how about you bake our fun mini apple pie wonton cups? October 20th- Carve Pumpkins. Don’t really want to deal with carving pumpkins? Then check out our post on 10 Stylish No Carve Pumpkin Decorating Ideas! Or check out all the cool no-carve pumpkin decorating kits on Amazon! October 29th- Make Caramel Apples. Not a caramel apple fan? Then try one of our chocolate covered apple recipes! October 31st- Go Trick or Treating. But make one of these 10 Frugal DIY Halloween Costumes first! November 2nd- Drink Hot Cocoa. The best hot cocoa (AKA hot chocolate) is homemade! Find a great recipe in our post on 10 Delicious Homemade Hot Chocolates! November 5th- Bake Pumpkin Pies. Or make a no-bake turtle pumpkin pie! November 14th- Enjoy a pumpkin treat. Maybe one of these pumpkin desserts will satisfy your pumpkin cravings. If not, there are 10 other delectable pumpkin desserts in this pumpkin treats post. 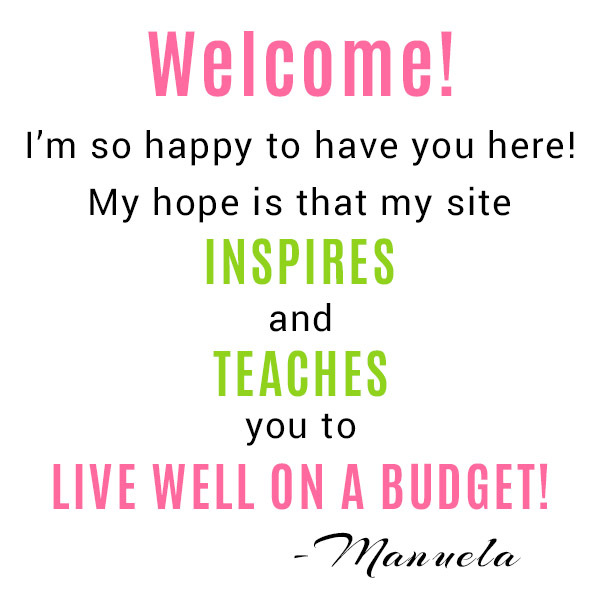 November 20th- Create a Gratitutde List. 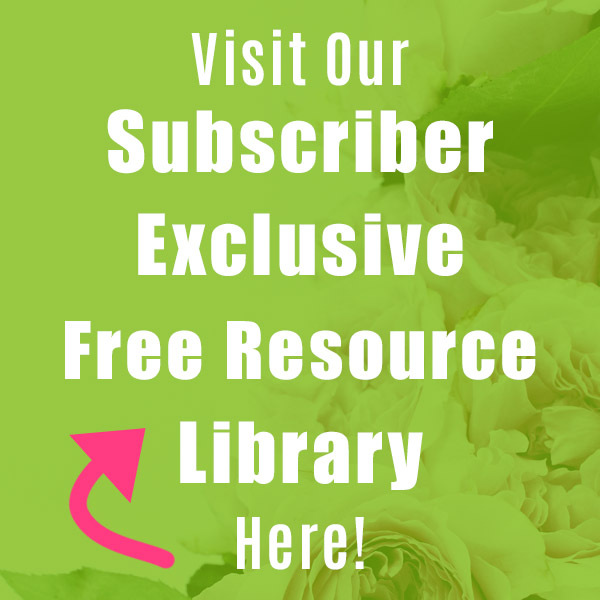 Our newsletter subscribers can find a printable gratitude journal page in the subscriber exclusive Free Resource Library. You can subscribe to our newsletter here. November 22nd- Thanksgiving. Make sure to read our post on Tips for Saving Money on Thanksgiving Dinner, and don’t forget your Free Thanksgiving Leftovers Printable Tags! November 28th- Collect Pinecones. Then either make DIY Scented Pinecones to make your home smell like fall, or do some of these 12 Fun Pinecone Crafts to make your home look like fall! 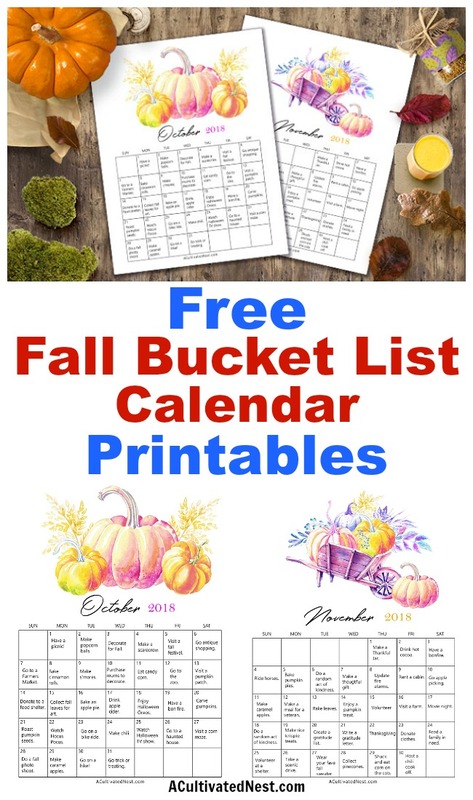 This free printable fall bucket list calendar is full of fun fall ideas that will help you make the most of the season! 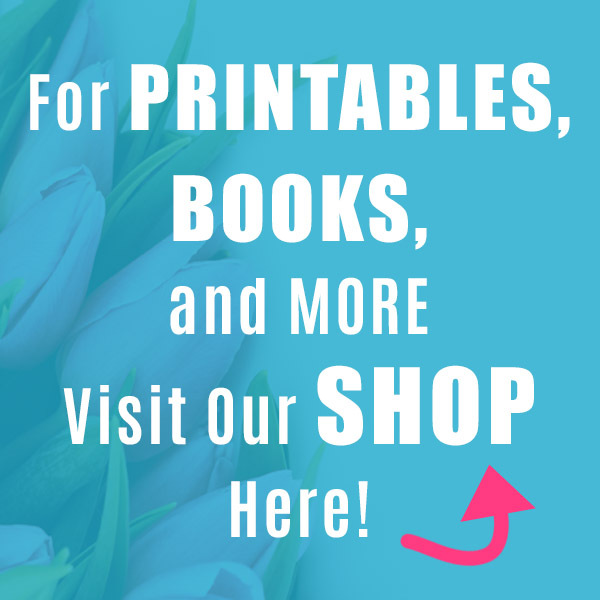 Download your copy of both pages below! What are your favorite things to do in the fall?